Before the young and fame-hungry took to Instagram to post selfies and present a hyper-curated image of their lives, there was Angelyne. The LA-based, platinum blond, pink-Corvette-driving icon is the woman who arguably coined the term “famous for being famous.” She is the fairy godmother to today’s Reality TV and Insta-stars. Rising to prominence in the 80s, thanks to her knack for self-promotion vis-à-vis a large number of billboards, today Angelyne has reached a cult status in a town where fame and longevity don’t exactly go hand in hand. While Angelyne has guest starred in cult films such as Earth Girls Are Easy, and dabbled in politics*, last year she became the focus of a short documentary series on LA icons. Amazing Angelyne, captures the self-made star in both her private and public worlds (although the distinction between the two is hazy at best). We caught up with the director, Ivan Olita, to discuss his experience making the short docu-style film and society's fixation with fame. *In 2003, she was a candidate in the California governor recall election. Her slogan during the campaign was: "We've had Gray, we've had Brown, now it's time for some blond and pink." 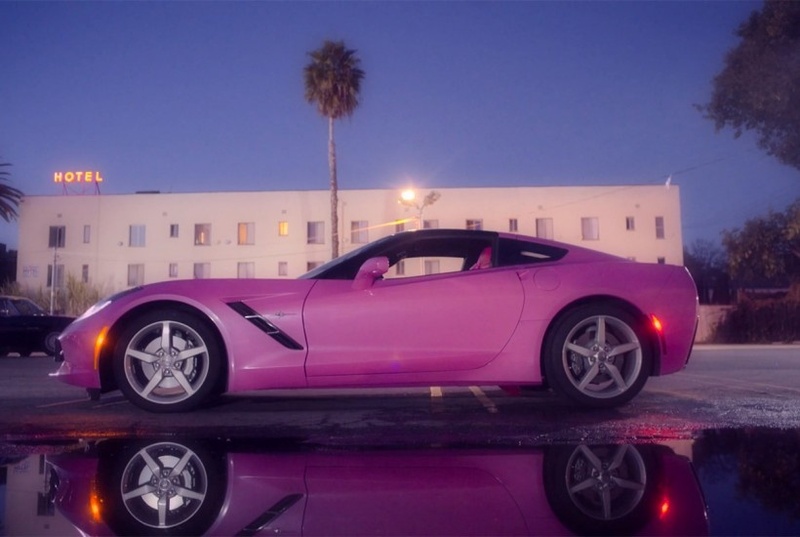 Us of America: Can you tell me a little bit about Amazing Angelyne? Ivan Olita: The idea was that I was a shooting a series of films about LA characters, called triLAgy. And it was basically meant to be a trilogy about LA characters that somehow helped to shape the city. They [all the subjects] each had their own different influence on the city. The first one was James Goldstein, and he was kind of the first guy to invest a lot of money into the whole architecture element (he owns a John Lautner house). Second was Mark Mahoney, who was this tattoo artist. He was kind of a gangster figure, and it was pretty interesting because he had both the celebrities (Tupac, David Beckham and Lana Del Rey) and more ‘sketchy’ kind of people going [to his tattoo parlour] to get a tattoo. And then there was Angelyne. Angelyne, I think, is very relevant. I think people kind of underplay her importance in shaping not only LA culture but, to me, the whole world culture, because she was the first person to just be famous for nothing. She was kind of a pioneer in self-promotion, and given the fact that self promotion has now become the currency of contemporary culture, I think she is pretty incredible. Especially when you consider that she was trying so hard to do it without any means, because she obviously didn't have access to any media besides the traditional ones. She relied on the [platforms] she had access to, which in her case were billboards. She would just buy these billboards and put herself up there to say: “This is me and this is my number, I’m famous.” I think it’s really fascinating the way she pioneered something very serious. You know she’s kind of a contemporary to Andy Warhol. In the entertainment world she was pretty on point if you consider what happened later with Paris Hilton and Kim Kardashian, you know? When did you first hear about Angelyne? I was coming back from the airport in an uber [when] she passed by with her car. The uber driver said, “Oh that’s Angelyne”. That was the first time I ever heard of her, and then I kind of forgot about her. But for some reason, I bumped into her at a flea market and decided to introduce myself. This is how the whole thing was born. Angelyne is notoriously hard to interview. How did you get her to agree to meet with you? Yeah, she is. I tell you, it’s a process. I should’ve shot a documentary about me shooting a documentary on her! But, yes she was very reluctant at first to do anything. I had to meet her I think 2-3 times [trying] to convince her. And then it was a nightmare, because she didn't want to show her face unless I paid her like $10,000 or something. So I said, “It’s ok. I honestly don’t need to show your face” and I kind of liked the idea that we don't see her face. Then, little by little, we got close and friendly. We shot several days in a row, almost a week...she would take her time. It [the shoot] became this thing where I was basically her lover or boyfriend. It was a weird feeling of both being a boyfriend and at the same time her, uh, nephew or something. We would shoot and then at a certain point... She’s a diva and she would be like ‘Well, Ivan I need to go and buy…’. She would want the stupidest things like, she’s not into expensive stuff, she wants pizza down the street or something. She’s like, “Guys I want pizza. Ivan you come with me and we go eat pizza.” And then, you know, obviously at a certain point I would demand that she would stand still or something because we need to shoot. It was very surreal to be honest, and I was very drained by the end. With the aesthetics and the cinematography of the film what was the inspiration? Well, I just wanted it to be very pink (laughs). I was actually inspired by all of her pieces, which are of course very pink. She had these music videos from the 80s and I just went for it. But, yes my priority really was for everything to be pink. Pink and a little bit powdery. The image is not sharp, that was kind of thing for me. For it to be dreamy, especially being in LA. What was the most difficult part of filming Angelyne? It’s not difficult it’s just, you know, she’s a diva and is kind of a messy diva, so to say. You're just there totally absorbed by this pink personality and it is, uh, something. There are objects all over the place and she tells you she wants to eat pizza… you’re just very sucked into this ‘Angelyne world’. I mean it’s great, and she gives you good energy, but it’s very demanding. She’s just like every diva who's not totally fulfilled. For instance, we had to go to put the gas in the car, buy juices, or eat pizza every two hours. Why do you think people are so fascinated by Angelyne? It’s pretty interesting. When you got in touch I went back to have a look [at Amazing Angelyne] and I realized that the video got a lot of organic viewership. I think it’s because all over-the-top figures always resonate with people. But she’s not about being over the top, she’s about being very true to herself. And this I think is the message: that not matter where, not matter how, no matter when, it’s always going to be very appealing to people. Plus, she did it before everyone and she’s kind of a legend to people. They have kind of this sweet feeling towards her. So, for example, now I kind of just saw on an Instagram of my friends’ that her car is apparently broken. He posted this picture and everyone was commenting on it– everyone was very sorry [for her]. Like someone said we should do a kickstarter to fix Angelyne’s car. Everyone feels that in a way she really embodied the 80s in LA, but by doing this she kind of also projected the 2015s and 20s in what will be the world next. Since she kind of created a connection between these two worlds, because if you wouldn’t see what she did in context it would just be something very of the times. Yeah there she is, this bombshell of the 80s doing her thing. Did you ever discuss social media or Instagram with Angelyne? Was she interested in it? We did, but she’s not into it. She feels she created it. Lastly, I have to know: What type of pizza does Angelyne like? She would always get the same, pepperoni. And it would always be from a place around the corner from her called Stefano’s Two Guys From Italy.